What was your first TV appearance? My first TV appearance was on Anglia TV in the early 90s, on a regional magazine programme in which I can be seen for approximately 2 seconds rollerskating backwards. Thanks for asking. How did you get involved withVideogame nation? 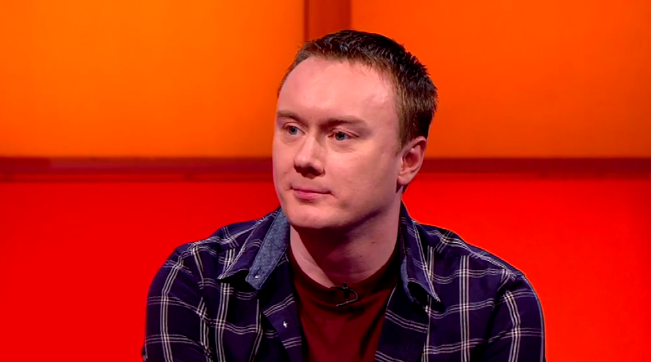 Very early on in the development of Go 8 Bit, I met a guy called David McClelland (great tech presenter on various telly things/live events) who worked for the Virgin Media video gaming TV channel, Ginx TV, which made VGN. He introduced me to them and we began working together in various capacities. 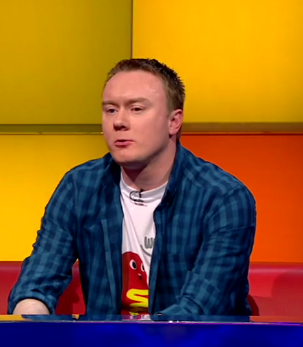 In fact, before I became a regular commentator (and occasional host) for VGN, Go 8 Bit was interviewed in the very first episode. 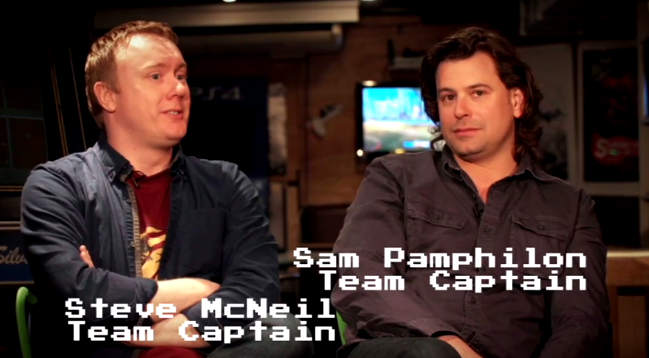 What was your most awkward TV moment and best moment on Videogame Nation? How did you get involved withConsole yourself? 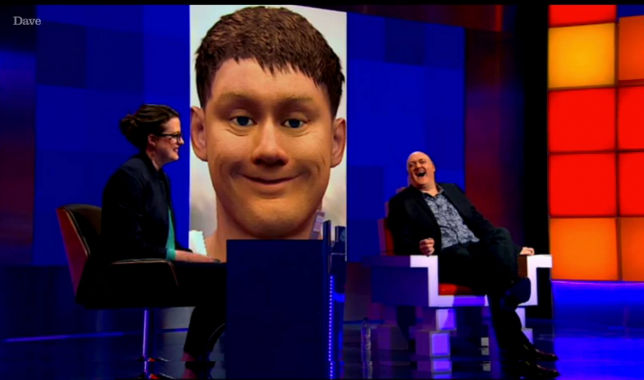 What was your most awkward TV moment and best moment on Console Yourself? Best moment on Console Yourself was finally being able to talk openly about my Minecraft addiction – there’s very few places where a man in his mid-30s can openly discuss that game without being reminded of just how much they’re wasting what little time they have left on Earth. 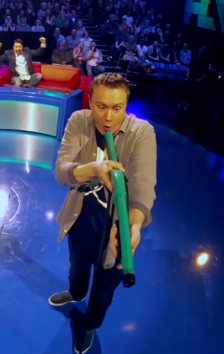 What was it like during the filming on of Go 8 bit? It was wonderful, and stressful, in equal measure. Me, Sam and Ellie had never done anything on TV on that scale before, so the stakes were really high not to be dreadful. What it like working with Dara? Dara was incredibly supportive and got us through it though. He’s nice. He’s like the opposite of Dan Maher. We often get asked if we mind him having his name in the title but the show simply wouldn’t have got made without him, or been anywhere near as good. We’re lucky he agreed to do it. And he’s lucky we asked hime, because now he can afford to build an extension on his house. 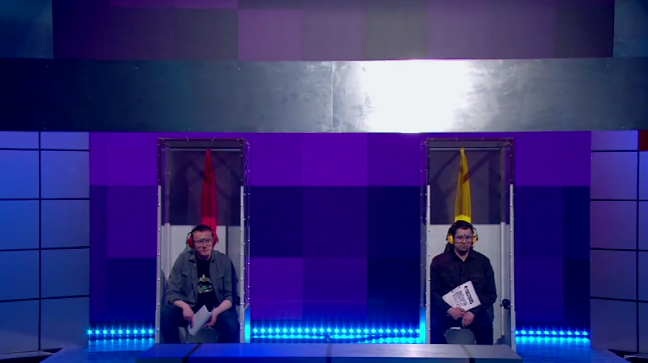 How did you get cast for Go 8 bit? I created it, with Sam Pamphilon. Although, in TV, that’s no guarantee you’ll still be in it. Thankfully our producer, Rohan Acharya, fought our corner tirelessly and managed to keep us onboard. God only knows if we’d have been in it if anyone else had been at the helm – we owe that man a LOT. 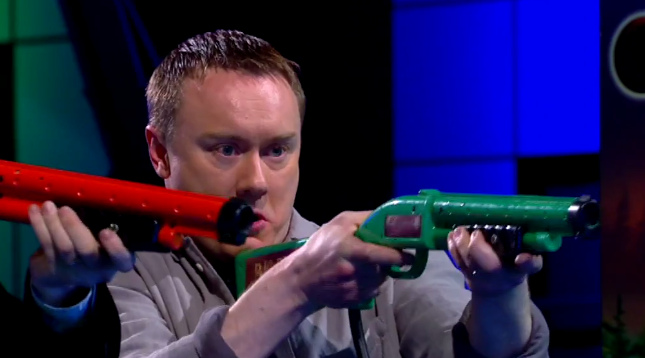 What was your most awkward TV moment and best moment on go 8bit? Best moment was having Bob Mortimer on my team. Three hours sat on a sofa playing video games with a comedy legend and personal hero. He was lovely. We just chatted about our kids. Like friends. I’m sure he remembers our meeting just as fondly. 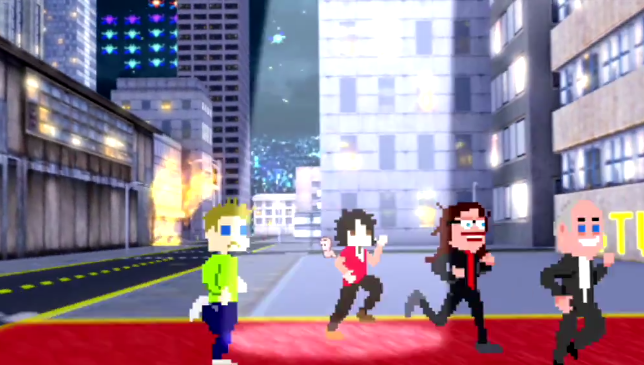 Has Go 8 Bit vision translated to the TV how you would have imagined would you change anything? 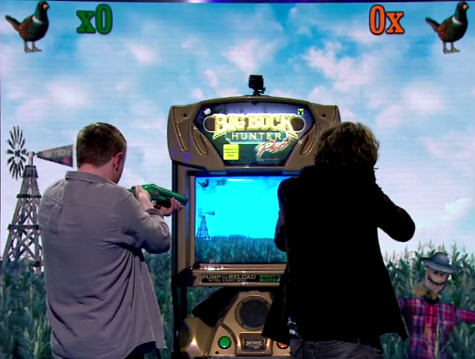 It really has – the show’s managed to keep the spirit it had live, which was just funny mates messing around playing games. It’s not about being the best at something, or playing at an elite level, it’s just an excuse to celebrate all the wonderful things about games and gaming. 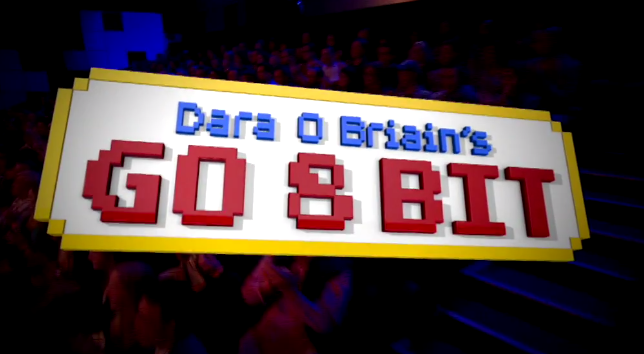 Have Dave Commissioned a 2nd series of Go 8 Bit? Would you consider getting people who made the games in a 2nd series on the teams like Sensible Soccer vs Kick Off featuring Dino Dini vs Jon Hare? We had some of the developers in the studio when we’ve used their games (the Gang Beasts team for example) but we haven’t yet had them take part in the contests. That might be fun though. We’ve also talked about getting Youtubers/pro gamers etc on (we had Ryan Hart, the pro Street Fighter 2 champ, on the live show a couple of times) so nothing’s off the table, although I think the show needs to remain, at heart, a comedy show. We’re trying to make something broad that everyone can enjoy, not just people who’d recognise David Braben in a pub. Could you also include maybe a points league for the series? When we did the show live, we kept track of the score across every show ever. We did 50 live shows and, insanely, it ended up 25 victories each. Russell Howard (who was on that night) suggested we have one more game of pong to decide who was best and, I’m pleased to say, my team won. Delighted. With the TV show, we needed the shows to be independent (incase they’re broadcast/repeated out of sequence) so we don’t refer to scores across the series but, again, it’s something we might revisit in the future. Your show, WiFi Wars, broke the Guinness World Record for “Most People Playing a Single Game of Pong” at the 2nd annual Royal Institution lecture. The previous record was 251, you managed to get it up to 286! How did it feel to break the record? Genuinely the best gig of my life. Me and Rob (Sedgebeer, the genius that invented the tech that makes WiFi Wars possible) grew up watching the Christmas Lectures so, to be doing our 2nd annual show at the R.I., being filmed by the BBC, breaking world record, was AMAZING. What else are you currently doing apart from please give us some details? We’re on tour with WiFi Wars at the moment so that’s pretty full on. Any days I’m at home, I’m looking after my daughter while my wife’s at work, so there’s not much free time at all at the moment. Not that I’m complaining, I’m really lucky that being with my family and being an idiot playing computer games are the 2 things that take up all my time! The Adman Grandstand 3000 – one of those early home Pong consoles. Absolutely brilliant – picked up one recently on eBay, they’re surprisingly cheap given how old they are (40+ years now). My favourite computer was my Amiga, and console the Megadrive. Do you have a favourite? I’ve a soft spot for the Amstrad CPC 464, as that was the first home computer we had growing up – again, treated myself to one recently, and have been slowly accumulating cassettes of all the games I remember from my childhood. I had an Atari ST and an Amiga 500 later on, and loved them both, honestly couldn’t choose between them. Consoles-wise, the SNES was my first, and is probably still my favourite, and the one I’m most likely to fire up if I want a nostalgia rush. What is your favourite retro games top 10? Oh man, there’s too many to choose from but, off the top of my head: Oh Mummy (Amstrad CPC 464), Frogger (arcade), Pong, Super Mario World, Championship Sprint, Tetris, Doom 2, Lemmings, Bomberman, Goldeneye (N64). Do you still game on the current consoles. If so, what’s your favourite game? Yeah, literally just grabbed a PS VR and was playing Batman Arkham last night. Absolutely incredible – YOU ARE BATMAN!!!!! Also, Allumette, the short film on it, totally took my breath away. Really enjoying Forza Horizon 3 at the moment too – I’m really busy and that game’s great because you can just dip in for a few minutes whenever you have time. I really HATED Unravel, but I don’t think that was the game’s fault. I had a deadline to review it for Ginx, and I was suffering from exhaustion from a combination of TV show prep and sleepless nights due to baby. Puzzles and exhaustion are a bad fit. Finally, what feature or review would you like to see on Retro Games master? I always try to champion the 80s UK computing stuff (Amstrad CPC, but also Spectrum/C64) – it feels like the American narrative of retro gaming (i.e. Nintendo/Sega) dominates discussion, so it’s always nice to see something about the UK scene. Dizzy the Egg, for the win!